Happy Fall from Nadia Watts Interior Design! Fall is upon us and I wanted to share recent news with you on Nadia Watts Interior Design. Our team has been working on wonderful projects and we are incredibly proud to share this year's publications below. For more pictures and updates on our projects, make sure to check out our recently revamped website and social media platforms! We are starting a reoccurring feature in our newsletter called "Watts Your Favorite...". This month I'm sharing my favorite tiles...next month rugs! Business is growing and so has our team. Heather Jobin joined the NWID team this summer, after spending the past 10 years in New York working at Christie's auction house. On a personal note, I wanted to share exciting news that Jane in our office welcomed her first child, Bradford Logan Romero earlier this Spring. We look forward to sharing more with you in our monthly newsletter! Thank you 5280 Home for featuring Nadia Watts Interior Design in the November/December 2017 issue! We loved working on this home in Congress Park! 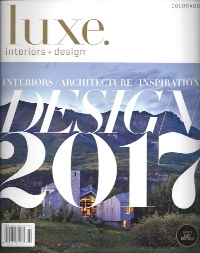 Earlier this year we were featured in Luxe Interiors + Design January/February 2017 issue twice for a feature on Living Rooms and Eye for Design Kitchens. Thank you Luxe Interiors + Designs! Check out the Press section on the NWID website by clicking here. This tile is truly a FUN tile. 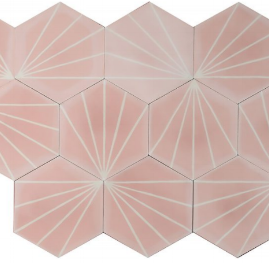 The hexagon shape allows for multiple patterns and styles simply by arranging the lines in a different direction. And the color is beyond dreamy and perfect for a modern and creative update. This tile is great when you want a classic, timeless look that has a little bit of an alter ego. The 'crackle' finish gives variation to each tiles and makes for a stunning backsplash. When laid out the look is elegant and totally unique! This tile is bold and edgy (pun intended!). The shape alone would add a dramatic element to any kitchen backsplash or bathroom tile work, but the grainy, free flowing, organic pattern make this tile a winner! Make sure to follow us for our latest updates, projects, and behind the scene pictures at Nadia Watts Interior Design.